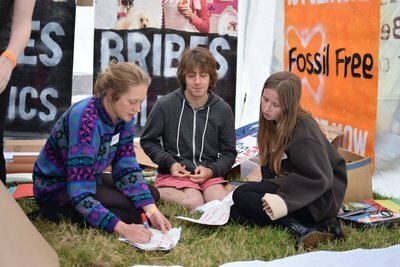 Power Shift is a student activist training camp organised by People & Planet UK, a student campaigning organisation that Gluaiseacht originally set up to emulate. The stated objectives of the camp are the following: develop powerful strategies to win tangible change.Learn and share skills to take the fight for transformational change into every space; and explore how we can create power beyond privilege and build movements of solidarity that take leadership from communities most impacted. Aoife:My decision to go to Power Shift was one based on spontaneity and intrigue. It was a rash decision made in a couple of hours, born despite other plans and logistics, because of a voice in my mind that screamed I’d regret it if I allowed this opportunity to slip by me. The word activism sparked something of curiosity and excitement in me, but I didn’t really understand its reality or how I could get involved. I always knew it was something I wanted to be immersed in, but unfortunately a real chance to engage had never materialised. Until, that is, I got the opportunity to go to Power Shift. Waking up every morning, secluded in a field just outside Manchester, my experience of my Power Shift was truly unique, exhilarating, and slightly surreal. The days were filled with a tight schedule involving different workshops, talks, and activities. The range of topics discussed and information I learned was endless and infinitely fascinating. I was inspired by the work that people had achieved, and their ambitious plans for the future. Throughout the talks, I was constantly amazed at the dedication and passion of the people I found myself among. In a political climate generally punctuated by cynicism, I found the message repeated throughout the weekend, incredibly refreshing. The focus of People and Planet, and all the people giving and attending the workshops, was on the solution to the problems, rather than the challenges. They acknowledged and educated about the problems that plague our society, not shying away from any harsh realities; but still choosing to place the focus on how we can fight these injustices instead of allowing the obstacles to paralyse us. I found this message so important and inspiring. The focus also wasn’t just on information, but also pragmatism. They focused on teaching skills and showing people how to run campaigns, protest, and assert positive change. The workshops centered around empowering the students, and instilling in everyone there the confidence to go out and fight for a better future. While at Power Shift, I met lots of lovely, and interesting people, and was overwhelmed by the friendliness of everyone involved. I didn’t really know anyone there before going, but my nerves surrounding that were immediately calmed. The atmosphere was warm and inviting, everyone talking eagerly to anyone and after 5 days, it felt that real friendships had formed. There was a great deal of laughter and fun, and my memories are nothing but positive. My gratitude for the opportunity to attend Power Shift is immense. It was an utterly unique experience in so many ways. It informed and educated me on many topics, but also alerted me to the existence of a strong activism culture, especially among college students. It was empowering and refreshing, and an opportunity to discuss big ideas with like minded and equally passionate people. I left Manchester utterly inspired, and cannot wait to get more involved in projects next year and use the skills that I have learned to truly contribute to the causes that matter and make a difference. Guoda: Powershift was an amazing educational experience. It helped me to grow as an activist, and made me more aware as an individual. I had the chance to learn about the most important issues surrounding us, and how to overcome them. We participated in workshops which specifically talked about the issues in communication and media, where we learned how to be respectful towards each other and how to correctly diffuse information. We talked about climate change and the fact that we cannot fight this issue alone - we need to work together to push governments and corporations to make immediate change. We talked about immigration, and how to take everything that is in our hands to make the lives of refugees better and to force the legislation of human rights. The information that I acquired during this event and the friends that I made there have made me aware and educated on the issues that I care about and that I want to fight for. Thanks to this, as part of the Environmental Society committee in Trinity, I hope to do a better job and be able to involve more people to be active and to fight for what they believe in, in productive and effective ways.